This may be the first time Thom and his younger brother, Andy, have appeared on the same album. Both are contributing songs to Ciao My Shining Star: The Songs of Mark Mulcahy to help the former Miracle Legion front man continue making music while he raises his three-year old twin daughters. If you weren’t aware, Andy Yorke has had his own band called Unbelievable Truth. They’ve been broken up for a while but appear to be back together, we think. Ciao My Shining Star: The Songs of Mark Mulcahy is out on September 29.
wtf? Thom has a brother? and he’s so much better looking! how did I not know this? andy’s also got a solo album that we released in the US (and aktiv released in europe) called “simple”. it’s on itunes and in stores around the world. I bought “Simple” and IT IS VERY SIMPLE!! jaja, it is ok, it sounds like a very minimalist radiohead, I recommend this song called “Let it be true” and “One in a million” They are great! Thom’s brother’s hot. Andy was probably the parent’s favorite. 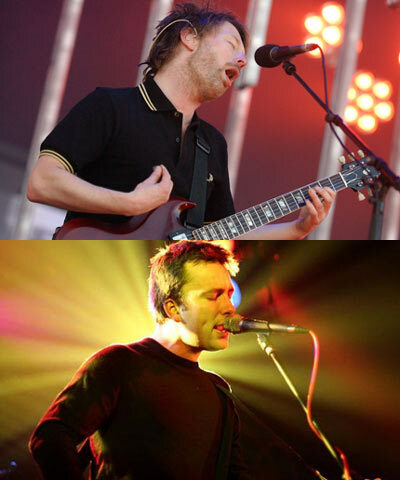 No wonder Thom has such a chip on his shoulder. @ Tara: Uh, what? First of all, I don’t think parents decided upon their favorite child by the measure of how “hot” they are. Secondly, Thom is the older brother by four years, and, by the way, the lead singer of RADIOHEAD, so if anyone has a chip on their shoulder, it’s the infinitely less successful younger brother. And Thom doesn’t have a chip on his shoulder, he’s just weird and paranoid and an alien from outer space.